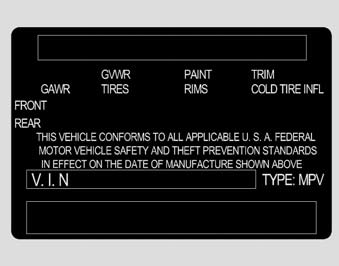 Never exceed the GVWR for your vehicle, the GAWR for either the front or rear axle and vehicle capacity weight. Exceeding these ratings can affect your vehicle’s handling and braking ability. Do not overload your vehicle. Overloading your vehicle can cause heat buildup in your vehicle's tires and possible tire failure, increased stopping distances and poor vehicle handling-- all of which may result in a crash. Do not travel with unsecured blunt objects in the passenger compartment of your vehicle (e.g. suit cases or unsecured child seats). These items may strike occupant during a sudden stop or crash.